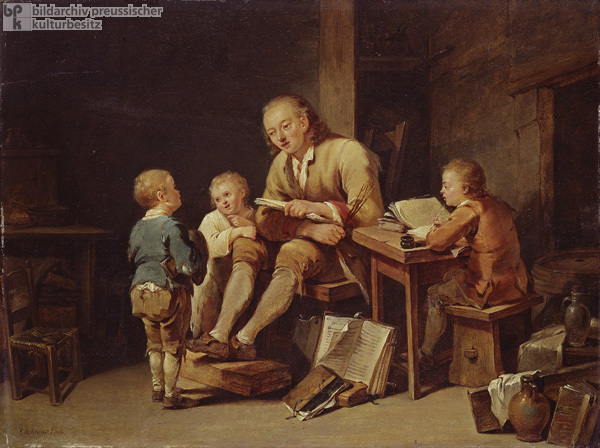 In the 1770s, elementary education had not yet become a state-supported undertaking, but rather was the responsibility of communal authorities in towns and village. They worked in close cooperation with the clergy, who, especially in Protestant lands, were responsible for instructing the population in basic reading skills. Village teachers were ill paid, and these positions were generally filled by modestly educated men of humble origins, who often engaged simultaneously as parish sextons or craftsmen. Members of the propertied classes could send their children to privately or publicly endowed academies, while many monied families maintained private tutors. In Prussia, compulsory education at the elementary school level was decreed on paper in 1717, and enshrined in the General Law Code of 1794. But only after 1806 did effective funding make it possible for Prussia to develop Europe’s most successful primary educational system. In the Austrian Empire, Empress Maria Theresa and Emperor Joseph II assigned responsibility for compulsory elementary education to the imperial government, and they devoted income and facilities acquired through monastery closures to the task. They were able to achieve considerable gains in education, principally among the empire’s German-speaking subjects, but also in the Italian provinces, and the Czech and Slovene lands. Oil on wood by Georg Melchior Kraus (1737-1806), c. 1770.